The University of Rhode Island men’s basketball team jeopardized their standing as a nationally ranked team after falling short against Valparaiso University, 65-62, in a hard-fought game Tuesday night in Indiana. No. 21/25 URI (5-2) looked to avenge last year’s loss to the Crusaders (7-1), which took place on a Tuesday morning in the Ryan Center as part of ESPN’s 24-hour tip-off marathon. The game, the Rams’+ first without E.C. Matthews following a season-ending injury, was a back-and-forth contest that concluded when then graduate transfer Four McGlynn missed consecutive 3-point attempts as time expired, and was the first of several heartbreaking defeats the team would endure throughout the season. Neither team was able to distance itself in the first half. The Rams kept Valparaiso’s star forward Alec Peters at bay for the first 20 minutes, with his 11 points coming on less-than-stellar 3-of-8 shooting and 1-of-4 from 3-point range. 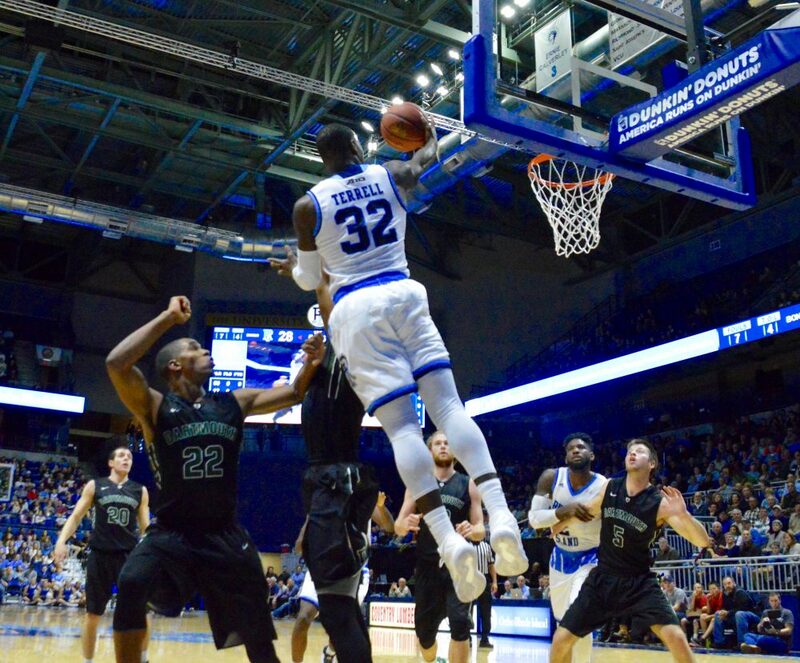 URI found their offensive igniter in junior Jared Terrell, who has now solidified himself as the team’s big-game stalwart after a hot start to the season that has him playing statistically the best basketball of his collegiate career, scoring 15.3 points per game on 48 percent shooting from the floor and beyond the arc. Terrell made three 3-point baskets in less than two minutes to give the Rams a 21-16 lead with less than eight minutes left in the half. Valpo battled back in the last minute-and-a-half of play, willing themselves to a 31-30 lead at the break following two made free throws by Peters with two seconds remaining on the first half. The second half saw Valparaiso change their game plan and forced the ball inside rather than trying their luck against the Rams stout perimeter defense. Peters found his groove and looked every bit the elite scorer his 25 points per game have shown him to be, as he tallied 16 of his 27 points in the second half on 5-of-9 shooting. He continued to get to the line, ultimately finishing a perfect 10-of-10 from the charity stripe, while his team went 18-of-21 to URI’s 8-of-10. Rams’ head coach Dan Hurley was both frustrated and impressed by the senior’s scoring barrage. Valparaiso clung to a slim lead until about midway through the half when they began to gain some separation from the Rams, who were unable to stay in an offensive groove. Terrell cooled from long-range, missing all three of his second-half attempts, but did add 12 more points for a team-high 21. Hassan Martin proved to be URI’s only other viable option, scoring 10 points. Matthews struggled to make his presence known for a third-straight game with a six-point performance (21 points in last three games combined). The junior guard would go scoreless for a stretch of nearly 25 minutes, and finished the game 3-of-9. The Rams found themselves down eight, the biggest deficit of the night, with just under five minutes remaining on the clock. URI abandoned the 3-point strategy after missing all nine of their second-half attempts, and much like the Crusaders did with their forward, pounded the ball into the paint. Martin led the surge, padding a balanced stat sheet that consisted of 16 points, six rebounds, two steals and two blocks. Despite URI’s efforts, the Crusaders held a 62-56 lead with under two minutes to play. The Rams, however muscled their way back after a couple of strong plays at the rim. A potentially costly Crusader turnover gave them a chance to make it a one-possession game. Matthews, desperate to find his form, took an ill-fated step-back 3-pointer and misfired. The Crusaders capitalized and regained a six-point lead with 35 seconds left on the clock. Strong defense and sloppy play from Valparaiso revived the moribund URI, as a Terrell lay-up and a Matthews’ tip-in put the team within two. Valpo’s Shane Hammink then missed an uncontested lay-up, which was rebounded by Martin, who was subsequently fouled. The stage was set. Martin had a golden opportunity to complete the improbable comeback, but fell victim to a vice that has plagued him in the past. He missed the front end of the one-and-one, his only misfire in five attempts, and put the Crusaders right back in the driver’s seat. The home team again failed to close the door shut, as a missed free throw of their own gave URI one last chance to tie the game. Déjà Vu glazed over the Rams as they were once again unable to make a 3-pointer in the closing seconds. Peters blocked Jarvis Garrett’s shot to give his team the narrow, nearly-squandered victory. Hurley, having been involved in several down-to-the-wire finishes over the last couple of seasons, and thought the outcome was more a testament of the high level of play exhibited by two competitive programs, rather than an indictment on URI’s ability to get the road win. URI next heads into hostile territory when they do battle with detested rival Providence College at the Dunkin’ Donuts Center Saturday at 4 p.m., where vindication for the Valpo loss and last year’s bitter defeat to the Friars will surely be on their mind.